The Outlook SMS Client plugin creates a button in Microsoft Outlook. If the button is pressed a message composer window is opened. In this window the SMS message can be created and by clicking on the send button it is sent over the network to the Ozeki Message Server engine for delivery. The sent messages are saved in the sent items folder of Outlook. If an incoming message arrives it is saved in the inbox folder of Outlook. 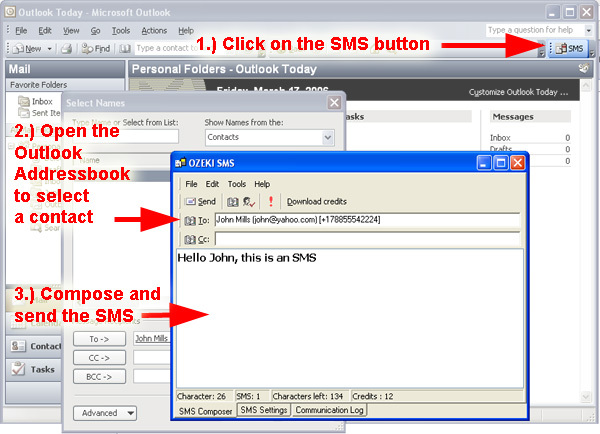 The user of this Outlook SMS Client can use the addressbook of outlook to look up and select the appropriate phone numbers for delivery.